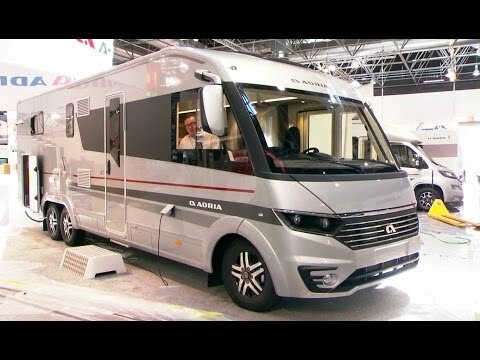 Treat yourself to a serious serving of luxury and style with the four-berth Adria Sonic Supreme I 810 SC – just watch this tandem-axle ’van on the lanes! Adria has been a serial Gold Award winner in Practical Motorhome’s annual Owner Satisfaction Survey because it builds ’vans that usually delight their owners. It’s as simple as that. The Slovenian-based manufacturer (now set to become part of the Trigano Group) has been building A-class motorhomes for some time, although this is its first offering on the tandem-axle Fiat Ducato Al-Ko Kober combo. Currently all Adria A-class offerings are labelled Sonic. Sonic Axess was the (just-discontinued) compact offering, Sonic Plus models are longer, and the flagship Sonic Supremes boast a very enhanced kit count, including Alde domestic-style radiator central heating. Supremes have a stunningly contemporary interior ambiance that will appeal to aesthetically aware buyers. These six-wheelers are often wrongly referred to as ‘tag-axles’. This is the name for a chassis with two wheels ‘tagging’ behind two driven by a solid rear axle. ‘Tandem axles’ is the correct moniker, and these, combined with front-wheel drive, produce a class leader in stability, handling and assured braking. But that long wheelbase does result in a big turning circle, so give it a meaningful test drive to make sure you are completely happy. Reversing should be hassle-free in our test ’van: not only did it have those ‘mine’s bigger than yours’ exterior mirrors, it was also fitted with reversing sensors, and a rear-view camera and monitor. You’ll have no valid excuses for squashing the wheelie-bin on the drive from now on. For those new to the A-class driving experience, the vehicle may initially seem over-wide, but actually it’s no broader in the beam than an overcab coachbuilt. One also quickly appreciates the benefits of that big windscreen. In the front main lounge, it’s immediately apparent that Adria hasn’t just stuck to what it has always done. Instead it has successfully introduced informal seating by substituting the formal fixed seats’ backrest cushions with those of the soft-filled, over-sized scatter variety. The permanently mounted island-leg table appeared to be a good compromise size-wise, although I did wonder whether a rectangular shape or one that was smaller – but with extension flaps – might have provided slightly greater flexibility. The Adria Sonic Supreme I 810 SC’s kitchen is located amidships, with the main run of base- and high-level units on the UK offside, with just the fridge/freezer across the aisle. Concave fronts to the high-level lockers add to the feeling of spaciousness without noticeably reducing the volume of storage. There’s a decent amount of worktop, and the ‘golden triangle’ is compact: for newbies, that’s the distances between the stove, sink and fridge/freezer. The luxurious rear boudoir contains an island bed that measures 1.88 x 1.44m (6'2" x 4'9"), with individual wardrobes and nightstands on both sides. This bed can be adjusted to make the most of the garage space beneath. Plus, you can raise the head end, making it easy and comfy to sit up in bed and read. An additional transverse double-bed powers down from the cab ceiling with just a push of a button – it is an impressive 2.0 x 1.37m (6'7" x 4'6"). Ahead of the boudoir is the centrally placed washroom and shower. Both can be made en-suite to the bedroom because a sliding door separates them, and a standard side-hinged door isolates this section from the rest of the motorhome. The arrangement allows for a large dry floor area for those showering to undress and dress in, while the clever duckboard duo adds a seat in the shower. Interior storage provision can be summarised in just one word: lots! Some practical thinking went into the design stage, with the result that storage is both flexible and varied with a good mix of lockers, cupboards and drawers. The Adria Sonic Supreme I 810 SC’s generous payload – north of 1000kg – should be sufficient even for the most extended trips. A storage provision that really floated our boat is the designated wardrobe for the occupants of the forward bed. A microwave oven and a spare wheel are both absent from the kit count of this Adria motorhome. The latter is particularly puzzling, because there’s a large garage to store it in. Furthermore, according to Adria’s price list, standard spec is the 130bhp engine. That will be perfectly adequate, but the 150bhp alternative will be better, and the 180bhp the best for a motorhome of this bulk. It seems strange that the flagship A-class biggie doesn’t have at least the 150bhp as standard, as currently it does occupy the rarefied atmosphere of the upper echelons of Adria’s market offer. This 2017 Adria Sonic Supreme I 810 SC is a brilliantly realised luxury motorhome that offers plenty of interior space for four and/or a sybaritic lifestyle for two. It’s devoid of an Achilles Heel, but it will be better-suited to long-haul holidays away, than pootling around narrow country lanes. And to see other Adria motorhomes for sale, click here.